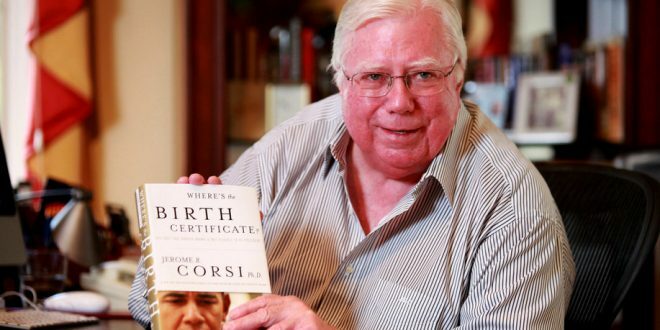 Mueller Subpoenas Prominent Birther Jerome Corsi - Joe.My.God. The lawyer, David Gray, said that he anticipates that investigators for the special counsel, Robert S. Mueller III, plan to ask Mr. Corsi about his discussions with Mr. Stone, who appeared to publicly predict in 2016 that WikiLeaks planned to publish material damaging to Hillary Clinton’s presidential campaign. He’s also claimed that Hillary Clinton has epilepsy, that Hitler escaped to Argentina, and that leftists are paying trolls to leave comments on his World Net Daily columns. Oh, and Satan runs the ACLU. Lately Corsi spends multiple hours a day live-streaming the latest QAnon batshittery on Youtube.